Whenever Microsoft sends out a new version of their upcoming operating system Windows 7 to their partners they can be sure that someone will post information about it soon thereafter publicly on the Internet. Many screenshots of features of the new Windows 7 operating system have been posted a day ago which showed some of the new features and design changes that Microsoft made. One of the more interesting features was Windows Media Player Light which was only briefly shown and mentioned in the information. Thankfully some additional information has come to light. A Windows Media Player Light video was posted that shows Windows Media Player light in action. One could think that the light version of the Windows Media Player is just the same unresponsive resource eating monster with hidden interface components but that is apparently not the case. Windows Media Player Light seems to open videos as fast as alternative clients that experienced users use on Windows XP and Windows Vista. Clients like SMPlayer, MPlayer or VLC open videos instantly and it seems to be that Windows Media Player Light can compete on that level. It would be interesting to know if the light version does use less resources than the full version of Windows Media Player. Another question that surely comes up would be the compatibility of Windows Media Player Light. Does it have the same functionality as the normal version or can it be used exclusively to watch multimedia files on the computer without having access to playlists, skins or premium services. Update: With the Windows 7 release in October 2009 came the confirmation that Microsoft did not include a lite version of Windows Media Player in the operating system. Windows users using Windows 7 who would like to use a lightweight media player can check out Media Player Classic instead which can be seen as a lightweight third party version of Windows Media Player. 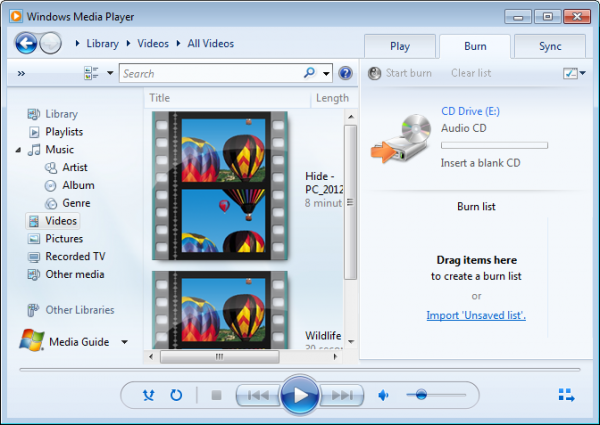 A look at Windows Media Player Lite, a resource-friendly version of Windows' default media player that Microsoft did not ship with Windows 7.
so far by all the screenshots and video’s Ive seen of windows 7, it looks like its going to be what vista -should- have been. They are finally adressing issues that have been around forever, and giving some of the old programs a facelift, and new functionality. if they keep this up, and non-bloat, I will be going to windows7 for sure in due time.